Rice Bowl with Potato Curry- ready in under 20 minutes! 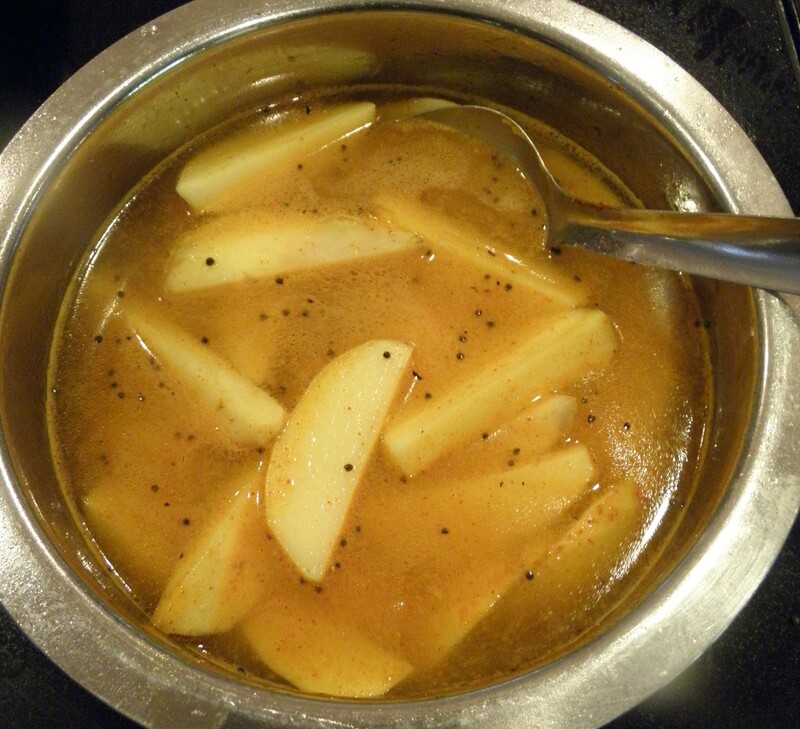 So this is a simplified version of the Potato Curry called Ambat Batata in Marathi. Literally translated, it means Sour Potato. Perhaps it gets its name because of the tamarind used in this curry. But with the brown sugar or jaggery and the red chili powder , it is a balance of the sweet, sour and hot flavors. And you know me! I will not compromise on the taste even when in haste:) This delectable curry cooks in 14 minutes, the same time it takes for the rice to cook. And the appetizing, calming rice bowl dinner is ready in under 20 minutes for you to enjoy and relax! In a saucepan, heat the oil over medium heat. Reduce heat to low, add the fenugreek seeds, mustard seeds and the asafetida. 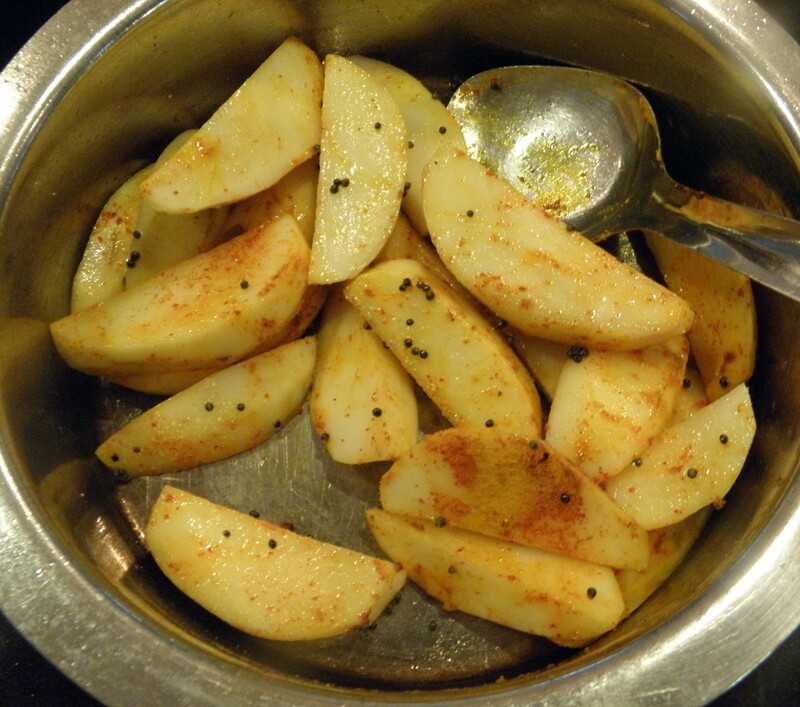 As soon as the mustard seeds start to sputter, add the cut potato wedges, turmeric, chili powder and the coriander powder. 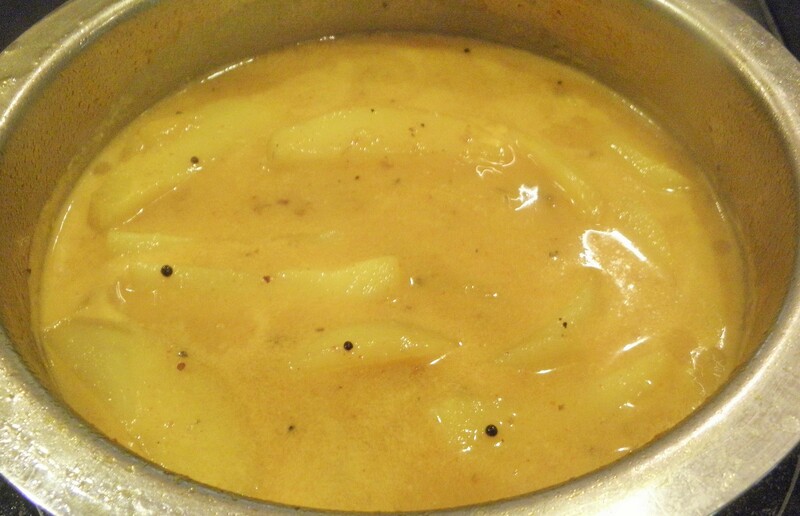 Stir well to coat the potato wedges with the spices. Add the 2 cups of water, stir and let the potatoes cook on medium heat, partially covered. A look just before partially covering the pot. Cook for about 7 minutes, add the sea salt, partially cover the pot and let the curry cook until the potatoes are fully cooked, about another 7 minutes. Remove lid, add the brown sugar or jaggery. Squeeze the pulp of the tamarind and the soaking water ( or the tamarind concentrate) into the pot, stir and add the black pepper and coconut milk mixture. Stir and let the mixture come to a low boil.Simmer for a minute or so on low heat. Remove from heat. Enjoy! Wishing you a relaxing Wednesday evening with your Rice Bowl with Potato Curry! Thanks Natasha! I like the flavor of coconut milk in this recipe too. I love ambat batata. Must make some soon!!! Thank you Ashwini! I am so glad that you liked it. I made it this weekend and it came out great. A truly simplified traditional recipe. Thank you Anjali! So happy to hear the review as you have tasted both the traditional and simplified version. Soul food in a Bowl- easy, light and delectable food the day after the huge Thanksgiving feast! 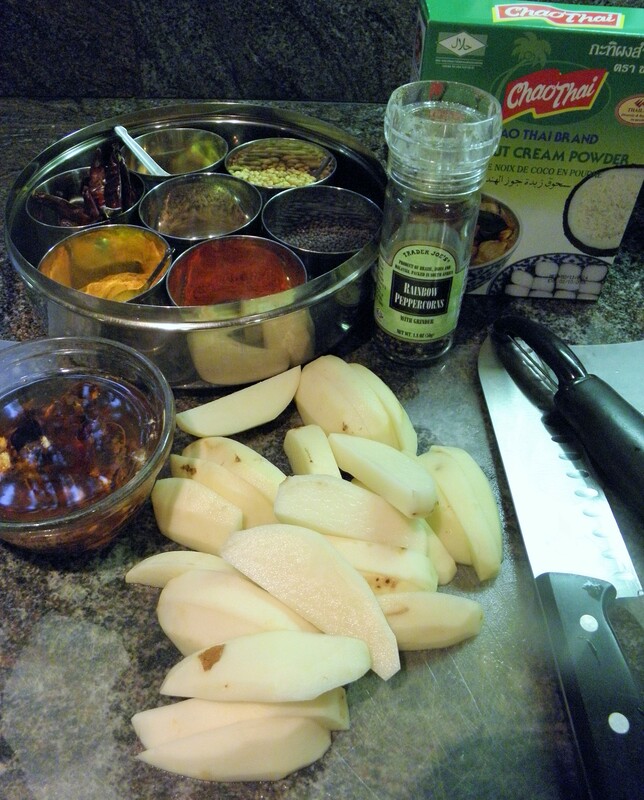 You will love this potato curry for sure then! Do let me know how you like it. It is one of my very favorites!